In the previous edition, the article on veld improvement for game dealt with establishment from planted seed and bringing the plants to maturity in the first season. Management after establishment is the key to harnessing the process of plant succession to optimise the initial investment. The degree to which plant succession progresses to what would be climax for an area under natural conditions, will be influenced by grazing or cutting height and frequency as well as periodic burning. Interventions of fertilisation and irrigation will modify plant succession, but while they do not override the basic principles their impact should be anticipated. The importance of planting Biomosome® veld seed blends appropriate for each of five different groups of biomes must be emphasised. Karoo; Succulent and Nama Karoo biomes Reclamation Priority in reclamation is attention to whatever the causes of degradation are. If overgrazing or underutilisation is the cause, management can correct it. Improvements will favour the success of palatable perennial grasses in the plant succession process. However, there is little that can be done about limitations due to shallow, stony and sandy soil. Steep gradients and poor drainage are also limiting. The final plant succession result will be affected. Here, annual grasses may well predominate, surviving by shedding seed heavily so that there can be good stands of new plants in succeeding seasons. Pioneer species in the planted seed as in the Biomosome® Reclamation range may turn out to be important components in the end result. While seeding with Biomosome® Reclamation mix of pioneer and subclimax grasses starts plant succession off, introduction and success with the climax plants is the next step. Often, there is some of the original species diversity in the soil’s seedbank. The way to assess the state of the seed bank is to observe what is happening under the protection of fallen or broken thorn trees in a degraded area. Such protection enables seed that is in the soil’s seed bank to germinate and the grasses to mature and flower for identification. These same plants are also sources of seed for the surrounding veld. There are usually other pockets of vegetation in degraded areas where climax species grow and from which seed will spread naturally. These sources may be adequate for this phase. If there is doubt about this, seedbearing material could be taken from nearby veld where desirable climax grass species are growing. The material is then distributed on to well-established swards grown from the seeding of the pioneer and sub-climax grasses. The seed should be allowed to mature on the spread-out plant material and fall out naturally when ripe. The seed will then be able to take its natural advantages in establishment. 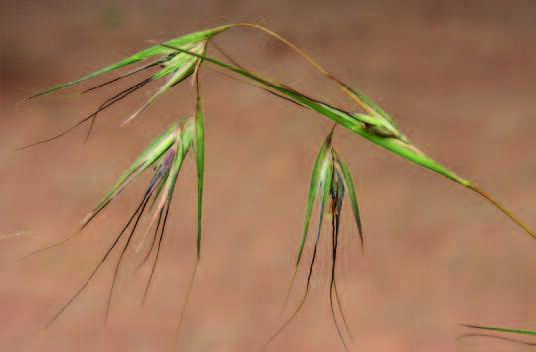 Taking Themeda triandra as example again, its seed tends to drop out and lodge itself in existing growth of grass with the awn trailing behind. The awn absorbs rain water readily, which causes it to twist. With seed embedded in the sward the twisting action bores the seed deep into its resting place where it will have conditions that promote germination. The resulting Themeda triandra plant is a strong competitor in these conditions and will eventually force its host plant out. The transfer should be from like habitat to like habitat. Overall species richness can be restored, but in each locality there will eventually be patches of dominance due to differences in the factors that made climax veld in the first place. Areas under rehabilitation have to be managed. They will go wrong if just left alone. Enhanced production Fertilisation and irrigation will modify natural plant succession. Biomosome® Wildlife mixtures are indigenous grasses for enhancement of yield to levels of production higher than natural grazing. The range is also based on biome principles. The mixtures are comprised of indigenous sub-climax species that depend on these interventions being continuous. The species in the mixtures will generally continue to be dominant fulfilling the role of climax vegetation, provided that grazing or cutting practices are sound. Regular soil analysis, good interpretation of results and application of the appropriate fertiliser are essential to the achievement of yields as may be required for high-value game in enclosed areas or production of grazing or hay to supplement natural veld. In a reclaimed area the degree to which the plant succession progresses to what would be climax for the area under natural conditions, will be influenced by grazing or cutting height and frequency. With excessive grazing it will not progress much from what is seeded. In enhanced production areas, fertilisation, irrigation and regular grazing or cutting will keep the composition largely the same as was established at seeding. However, these conditions will keep many favoured climax veld grasses out. For example Themeda triandra red grass does not compete well at high levels of applied nitrogenous fertiliser. Whether the aim is reclamation or supplementary feed, with undergrazing or infrequent cutting or any other defoliation, such as fire, plant succession will progress to Cymbopogon spp, turpentine grasses, Hyparrhenia spp, thatching grasses, Andropogon spp and other increaser I species that are unpalatable and have low nutritional value. These grasses are likely to be present naturally to a greater or lesser extent and are a constant threat. Not only do these grasses shade out desirable grasses, but many exhibit allelopathy, producing substances that inhibit the germination of other grass species’ seeds. The ideal will be grazing or cutting to approximately 100 mm twice or three times a year. The final graze or cut should be at the end of autumn after nutrients have been translocated to the crowns of the perennial grasses in dormancy and the seed shed for build-up of the seed bank in the soil. In most game situations this is impractical, but it is a guide as to the kind of plan management. Sunlight at ground level is necessary for the development of tillers. Tillers are the very short stems of tufted perennial grasses that grow from their crowns. Nearly all new growth of grass leaves is formed on the tillers. It is the extension of some of these productive stems that are the seed stalks with comparatively few leaves. Therefore not only grazing, but also the amount of material left on the ground should be monitored. With grazing animals this is typically a quarter of the growth, trampled or left because of urine or dung. Accumulation of this material, which is the thatch built up over years and cutting out sunlight, needs removal by fire. Burning in line with best practice of the district concerned is therefore necessary for sustained vigor and production. Start veld rehabilitation with appropriate indigenous seed, whether to reclaim or raise levels of production, and manage consistently to keep the plant succession process on track for optimum reward.